Clearance items are not subject to further discounts or incentives. Items are limited in quantity and subject to availability. All sales are final, non-refundable and not subject to cancellation. Free Delivery to your door is included to most US addresses. 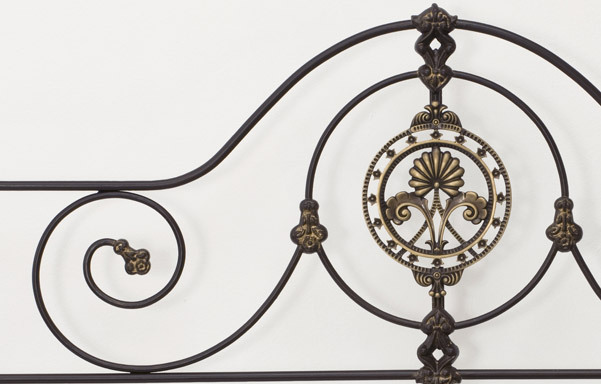 Authentic 19th Century European bed design with intricate centerpiece cast in solid brass. Heavy solid brass pineapple finials crown the bed posts. Scrollwork and rope details hand forged iron. The decorative bed rails will allow the use of a bed skirt if desired. Items that are in stock are ready to ship within a few days. When you add an item to your cart, availability is shown next to each item on your order. Shipment to most continental U.S. addresses is made by our own trucks or carriers that specialize in furniture delivery. We take care of all the arrangements and you will be contacted when the delivery is scheduled to be made. Shipment to remote locations, off mainland, Hawaii, Alaska, Canada and international addresses is easily arranged (give us a call for a quote). Depending on weight and size, items are shipped one of two ways to most continental U.S. addresses: White Glove or Express Delivery. The “Shipping Class” on each product page specifies the type of delivery. Available to most addresses in the continental US. - Packaging debris is removed. Clearance items are delivered to your door and do not include extra white glove services. - Removal of old mattress or mattress set is available for an additional charge in most locations or it will be brought to a designated location on premises area. For more information give us a call at 800-582-6229 or email info@charlesprogers.com. - To deliver up more than two flights of stairs give us a call at 800-582-6229 or email info@charlesprogers.com. We’re here to help. Review: "I looked at a lot of beds before I purchased this one, but once I saw it in the showroom I could tell that it was made with craftsmanship far superior to the other beds I had been looking at from west elm, crate"
Review: "Delivery and set-up a snap (and very fast! ), and the Charles P Rogers folks were super helpful every step of the way. The bed itself is awesome. It's my primary guest bed and I've had nothing but compliments in terms of its comfort and appearance. The dark wood, simple yet classic / elegant design is perfect and easy to design around." Review: "The bed came in good time. My husband was out of town and I assembled it myself without problem. However, it seems that I can feel the middle bar through the mattress. My husband looked at the assembly when he got home and found no errors. The four platforms do not settle in their areas perfectly, but when we put the mattress down they seemed to settle in place ok. We checked the middle feet that are raisable, but adjusting them did not solve the problem. We are ok with it, but it's not perfect. Also, the color is bit more red then I prefer, but again I can live with it. The height is perfect." Review: "The bed arrived within days of the order. The packaging was efficient and everything was protected. Not a scratch on any piece. I was a little intimidated about the assembly until I watched the video. It is recommended that two people assemble the bed, but this 69 year old lady was able to do it relatively easily." Review: "I'm delighted with the purchase. Since I live on the upper floor of a San Francisco apartment building I was concerned about buying a bed online. I need not have worried. The minimalist design made it possible to ship the bed in three easy to handle cartons which Fedex delivered to my apartment door, not to the front door of the lobby. Excellent. Incidentally, customer service was able to provide the exact dimensions of the shipping cartons before I placed the order. 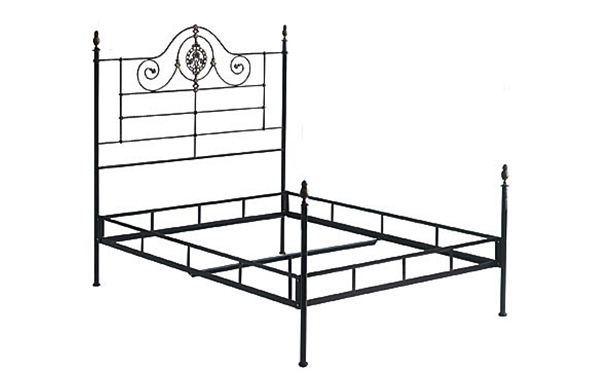 Both the material and the workmanship of the bed are top notch and the bed was easy to assemble. I am a happy customer and would not hesitate to make another purchase from Charles P. Rogers." Review: "I had these beds shipped to Puerto Rico, all shipping done through Charles P Rogers and it was perfect everything went very smoothly. Shipping wasn't cheap, but worth it. They were easy to but together, the beds came super protected and had everything you needed. Even lovely color crayons for future dings I might put on the wood, thanks :) The beds are beautiful my husband and I love them. We got the dark mahogany and the tiger mahogany. We can not say anything negative about these beds. I did not get there mattresses,we already had, but it sounds like these are very good also. Will definitely consider them next time we are looking for mattresses. Tina was so great in preparing and organizing everything. Thank you so much for the great company you work for and the knowledge you have for the products you work for." Review: "The shipping time for this bed was incredible. My parents recommended the brand and I'm glad I found this more modern design. The assembly was super easy. I'm most impressed with the sturdiness and quality of the wood. The only issue I had was a Paypal tracer payment issue before buying the bed." Would you like to recieve periodic updates on new products and special offers? © 2019 Charles P. Rogers. Charles P. Rogers® is a registered trademark of Charles P. Rogers & Co., Inc. Please enter your email address and then click "Submit". ✔ Extra discounts from made to orders and prior prices. ✔ Free Shipping to most U.S. addresses on orders $299 or more.